Haiti Road Construction - President Jovenel says: TPTC was on its knees when I became president, BUT Not Anymore! "Today I see a Ministry of Public Works that is working and I am proud to say it." Haitian President Jovenel Moise says the Ministry of Public Works (TPTC) was on its knees when he first came to power on 07 Feb 2017. People used to wonder what is the purpose of a ministry of public works when all the roads in Haiti are in such terrible conditions. 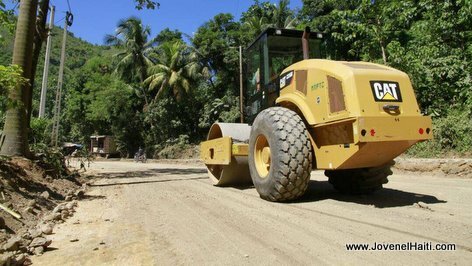 Not only that, all the major road works like paving and asphalt were being done by foreign firms for lots and lots of Dollars U.S.
President Jovenel Moise, in a recent visit to Camp Coq in Northern Haiti told the media that the 30 kilometers long, 7 meters wide road construction project linking Camp Coq to Vaudreuil is being done by the Nothern division of the Ministry of Public works (Direction Departmental Nord / TPTC-NORD) and is expected to be completed by December 31 2017. "I am proud to say that TPTC-NORD is fully in charge of this construction site," President Jovenel said, "The Ministre gives the order, and TPTC-NORD carries out the order." "You knew how much one kilometer of road building costs in this country," the president said. "When a president says he is going to construct 30 kilometers of road you know what it means." The Road from Camp Coq to Vaudreuil will cost the government about USD $120,000 per kilometers, the president said. compare that to the million plus dollars they used to cost before.